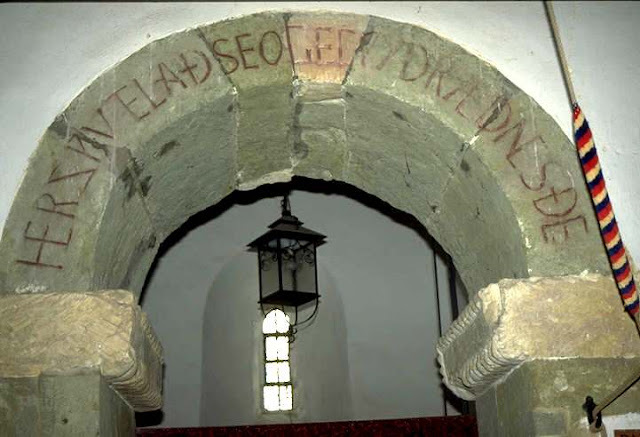 There are a few well known cases of vernacular language inscriptions within churches. The Saxon Church in Breamore, Hampshire, is noted for a prominent Anglo-Saxon inscription over the archway. Dated around A.D. 1000, it translates "Here the covenant is manifested to thee". Since the 1960s we have focused a great deal of attention on liturgical Latin versus the vernacular, but this conversation has by now tended to rather break down into simplistic all-or-nothing camps. 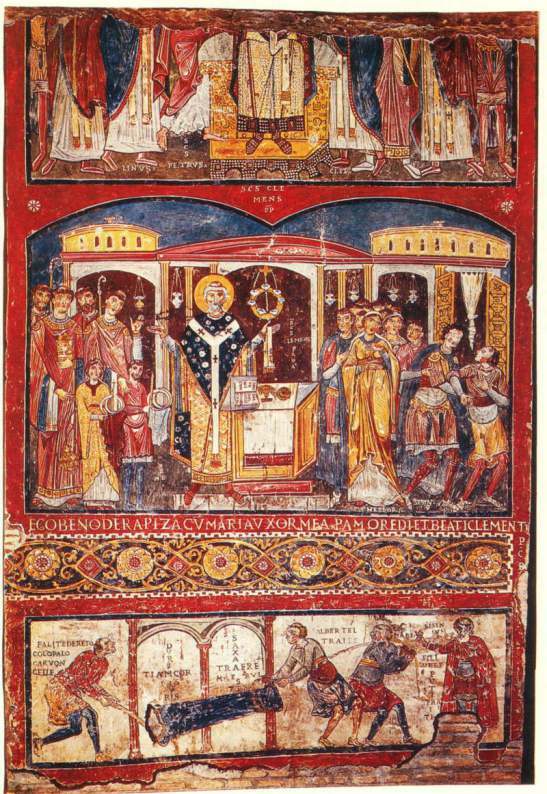 Rather than being brutally minimalist about the whole question, it might be worth examining how language can be used not only liturgically but supplementally: to decorate sacred spaces and narrate stories from sacred history, while providing an essential cultural chain stretching from the modern world back through the medieval period and into antiquity. Architecture is, as in the examples above, a great way to accomplish this subtly and yet effectively. The hymns and popular songs of Christmastide offer a model for hymnody as well. They seem to easily switch between Latin, hieratic English, modern English, other European languages, and even a few regional English dialects with facility. In adoration before the praesepio, no one seems to have any problem with linguistic code-switching even within a single hymn. They will start Adeste Fideles in Latin and end it in English. And no one ever complained that there was a Hebrew Alleluia or Greek Kyrie in the middle of the Latin Mass. Nonetheless, I am guessing many contemporary liturgical minds will recoil from taking a page from the Saxon Church or from Caedmon's Hymn and using, say, the Anglo-Saxon language in English ecclesiastical art and hymnody. Very likely, its archaic incomprehensibility holds very little appeal for liberal churchmen, and its vernacular novelty holds very little appeal for traditional ones. But it is worth considering whether, in leaving languages like these strictly in the past, we are failing to emphasize the essential continuity between the Church of Augustine, Caedmon, and Newman. And we are certainly ceding a great swath of our own historical territory to the Enemy, who seems bent on reframing the Middle Ages as a popular but quasi-fantastic realm of castles, bards, wizards, Vikings and fairies—but no Church. Since the very day of Pentecost, the Church has been able to speak in the various tongues of men. Since then we have learned to speak many more, and all our various attempts in that regard have dotted the globe. Rather than reduce this divine gift to a mere line of scrimmage in an absolutist liturgical battleground, let us deftly make use of all these languages as fully and as cleverly in all the ways we can, in fulfilling our divine mandate to pour out the Holy Ghost upon the world.